This handle is designed to be used with the Rekola Reflex swiveled squeegee. Together with the squeegee the Rekola Reflex extendable handle forms an ergonomic utensil for cleaning hard top floorings in S-curve mode. By adjusting the length to the right length, the most ergonomic working position can be achieved. All smooth and sealed hard top floors for hygienic cleaning results. Ideal for use in healthcare, nurseries, schools, universities, offices, public buildings, food industry, hospitality, pharmaceutical and cleanroom areas etc. Used in conjunction with Rekola Reflex swiveled squeegee. 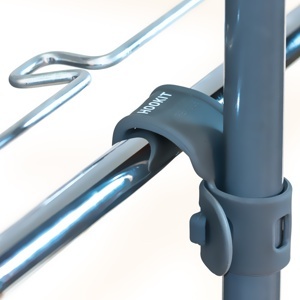 The Rekola Reflex Extendable handle has a flexible height adjustable turn-lock which extends the handle from 1m to 1.8m. 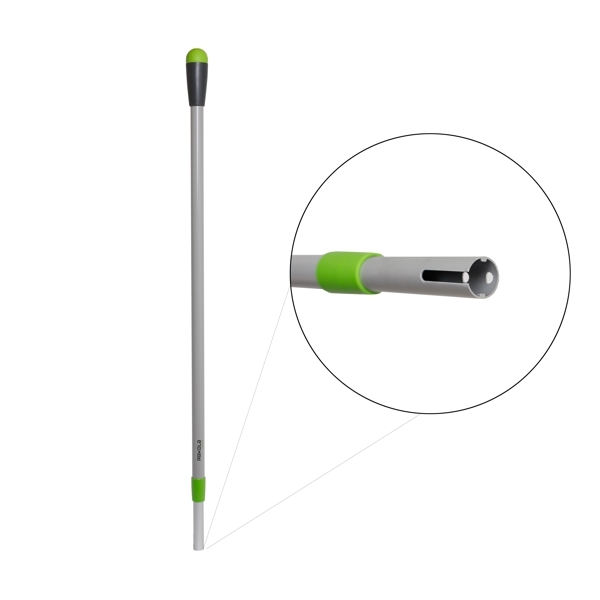 The Rekola Reflex Extendable handle can be extended to suit the height of the user – ideally to the nose level of the user while the Rekola Reflex squeegee is on the ground. Right handed users*: Together with the Rekola Reflex squeegee the Rekola Reflex extendable handle forms an ergonomic utensil for cleaning in S-curve mode. Unscrew the collar from the Rekola Reflex squeegee and slide on to the handle. Bend lid backwards so that handle can penetrate into the swivel. Observe the position of the blocker inside the swivel slides into the cap of the handle. Release lid and turn collar firmly back on the squeegee. *Left handed users follow the same method but reverse right and left. The handle length is adjustable to achieve an optimal ergonomic position for the user. During cleaning one hand is on top of the handle while the other hand guides the tool in an S curve mode. No additional pressure or force to the tool is required. Rekola Reflex extendable handle made of aluminum and synthetics and made out of virgin materials: may be used for recycling programs. 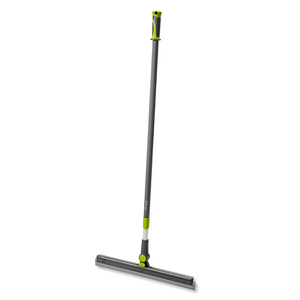 The extendable handle of the Rekola Reflex can be adjusted to working circumstances requiring a longer or shorter handle, without demounting the squeegee. For color coded areas a set of colored collars art. 13-0110012 for 16-0010/2 Rekola Reflex squeegee is available.